Hematuria; Urinary Tract; Cystoscopy; Ultrasound; Urogram; Malignancy. Objectives: Visible hematuria (VH) is a common urological complaint. A history of initial or terminal VH in men is indicative of a lower urinary tract (LUT) source. A careful clinical history could limit unnecessary extensive upper tract imaging in this group of patients with VH. We conducted a single-center prospective study to examine the usefulness of investigating the upper tract in patients with a history of VH likely from a LUT source (initial and/or terminal VH) with specific reference to the incidence of demonstrable significant upper tract abnormalities. Methods: We conducted a single-center prospective study of consecutive male patients presenting with VH over eight months. All patients underwent standard investigations including physical examination, flexible cystoscopy (FC), and radiological imaging (ultrasound scan (USS) and/or computed tomography urogram (CTU)). Those with a clear history of initial or terminal VH were identified for further scrutiny with regards to detectable upper tracts abnormalities. Results: In total, 57 patients (aged 23–95 years) with initial or terminal VH were identified. Of these, 56 had FC and nine patients were subsequently diagnosed with a LUT malignancy. With regards to upper urinary tract (UUT), 35 patients (61.4%) had an USS, 46 (80.7%) underwent a CTU, and 25 (43.9%) patients had both. In this group, no UUT malignancy was identified on upper tract imaging. Conclusions: Initial or terminal VH patients may not need extensive upper tract imaging. FC is recommended, but a non-invasive USS can be a safe initial investigation for the UUT, with a CTU subsequently considered in those with abnormalities on USS and those with ongoing bleeding. Further combined multicenter analysis will help corroborate these findings and could have several beneficial outcomes including a reduction in investigations cost, patient inconvenience, and ionizing radiation. Hematuria is a common urological problem, which is typically categorized into non-visible (NVH) and visible hematuria (VH). The prevalence of NVH ranges from 0.9 to 2%. Up to 2.6% of the population will experience at least one episode of VH during their lifetime.1,2 Investigation of both NVH and VH, therefore, constitutes a significant proportion of the urology outpatient activity across all urological and radiological departments in the UK. Due to the strong association between VH and underlying urological malignancy, the British Association of Urological Surgeons (BAUS) and the National Institute of Health and Care Excellence (NICE) have recommendedd complete evaluation of both the lower urinary tract (LUT) and upper urinary tract (UUT) to exclude a urinary tract abnormality. This includes a detailed urological history, physical examination, blood tests, and urine examination. Additionally, most patients with VH require cystoscopic evaluation of the LUT combined with radiological imaging such as computed tomography urogram (CTU) and/or ultrasound scan (USS) for evaluation of the UUT.3–5 There is no clear consensus with regard to the most appropriate choice of upper tract radiological imaging for patients with VH. Thus, most units will manage all patients with VH in much the same way with little or no variation when assessing the UUT. The aim of this study, therefore, was to prospectively examine the usefulness of investigating the upper tract in patients with a history of VH likely from a LUT source (initial and/or terminal VH) with specific reference to the incidence of demonstrable significant upper tract abnormalities. We conducted a single-center, prospective evaluation of all consecutive male patients presenting with VH to East Lancashire Hospitals NHS Trust between September 2015 and April 2016. As per the departmental protocol for VH, all patients were managed in a standardized manner at presentation to a dedicated hematuria outpatient clinic at one of two hospital sites (within the same hospital trust). All patients were initially assessed by one of our experienced urological doctors, all of which had extensive experience in managing patients with VH and performing flexible cystoscopy (FC) procedures. All patients had their demographic and clinical data recorded using our departmental hematuria proforma including the nature and type of VH (painful or painless, initial, terminal or total, association with clots), presence of associated LUT symptoms, history of documented urinary tract infections, previous relevant medical and surgical history, occupational history, regular prescribed and non-prescribed medication (including anticoagulant therapy), family history, and other identifiable risk factors such as smoking. All patients also underwent a physical examination, including a digital rectal prostate assessment. As per international guidelines, all our patients with VH (of any type) were evaluated using a FC to assess the urethra, bladder, and prostate. However, to evaluate the UUT, a radiological imaging scan was organized (USS and/or CTU) but due to the lack of standardized recommendation in guidelines on which upper tract imaging to choose, the type of scan was left to the discretion of the urologist undertaking the hematuria assessment and FC. In addition, blood tests and urine tests (microscopy, culture, and cytological analysis) were performed based on the discretion of the examining urologist. For this study, all male patients presenting with VH, those with a clear history of initial or terminal VH were identified for further scrutiny with respect to upper tract abnormalities found on USS and/or CTU. The data was recorded on a spreadsheet, and simple statistical analysis was performed using Microsoft Excel. 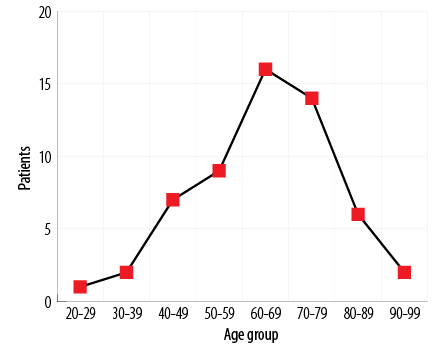 Figure 1: Age distribution of male patient cohort who presented with initial and/or terminal visible hematuria (n = 57; range 23–95 years; median 64 years). Figure 2: Flexible cystoscopy findings in the 56 patients who presented with visible hematuria (initial and/or terminal). A total of 311 consecutive male patients presented with VH to our hematuria clinics between September 2015 and April 2016. All patients underwent the investigations described in the ‘Methods’ sections. From this group, we further identified 57 (18.3%) patients presenting with VH, which was exclusively initial and/or terminal. This cohort with a clinical history suggestive of LUT bleeding represented the study group, which was subjected to more detailed analysis. The median age of this group was 64 years (range 23–95 years) [Figure 1]. The other 254 patients were excluded as the VH was ‘total’ in nature or the exact nature was ambiguous. Nine (16.1%) patients had evidence of an obvious bladder tumor. Nineteen (33.9%) patients had normal looking LUT. Sixteen (28.6%) patients had demonstrable enlargement of the prostate, occasionally with obvious increased vascularity involving the prostate (e.g., engorged vessels, contact bleeding on passage of the FC). Five (8.9%) patients had urethral strictures. One (1.8%) patient had bladder neck (BN) stenosis. Four underwent biopsies and histological analysis confirmed inflammation with no evidence of malignancy. In two cases this was presumed to be secondary to proven coliform infections. All 57 patients had subsequent radiological imaging to assess the UUT by either an USS (n = 35) and/or CTU (n = 46). No significant UUT abnormality was detected in any patient. We defined a ‘significant’ UUT as a diagnosis either of an UUT malignancy or a benign condition requiring treatment/intervention. Thus, in this cohort of patients with initial and/or terminal VH, no UUT malignancies were diagnosed at all. The results are summarized in Figure 3. Our analysis showed that 81 imaging scans were performed in 57 patients. An USS was performed on 35 (61.4%) patients. In these, the majority of USS (32/35) were reported as normal, while two patients had reports which commented on dilated renal collecting systems (on the subsequent CTU scans one result was reported as normal while the other confirmed benign extrarenal pelvis), and one (1.8%) patient had a 1.6 cm renal angiomyolipoma (AML). Of the 57 patients, 46 (80.7%) had a CTU performed. Of these, 42 (91.3%) patients had normal UUTs, two (4.3%) patients had scans that demonstrated bilateral tiny (2–3 mm), non-obstructing renal stones, one (2.2%) patient had an extrarenal pelvis, and one (2.2%) patient had a 1.8 cm renal AML. Furthermore, 25 of the 57 (43.9%) patients underwent both USS as well as a CTU. In this cohort with dual imaging, the majority (22/25) were reported as having normal upper tracts on both imaging modalities. Two patients had mild dilatation of the renal collecting system on the USS; however, the subsequent CTU was reassuringly normal. The other remaining patient had a 1.8 cm AML identified on both scans. Figure 3: Summary of results of the hematuria investigations (VH: visible hematuria; USS: ultrasound scan; CTU: computed tomography urogram; TCC: transitional cell carcinoma, BN: bladder neck; AML: angiomyolipoma). In this study, the work was based on the specific history of initial and/or terminal VH in male patients, which is considered indicative of bleeding from a LUT source such as the urethra, prostate, or BN.6 Although most urologists will record this detail, this clinically important information does not appear to influence subsequent management. In reality, most departments do not distinguish between patients where the history suggests LUT bleeding and those with other modes of hematuria presentation, such that all patients undergo the standard investigations. We examined the hypothesis that in this subgroup of patients with initial and/or terminal VH, significant upper tracts abnormalities are not commonly encountered. The EAU, BAUS, and NICE in their guidelines have stated that men with a history of microscopic and gross hematuria should undergo a urethrocystoscopy during diagnostic evaluation and it is clear from our analysis that examination of the LUT with a FC is mandatory. 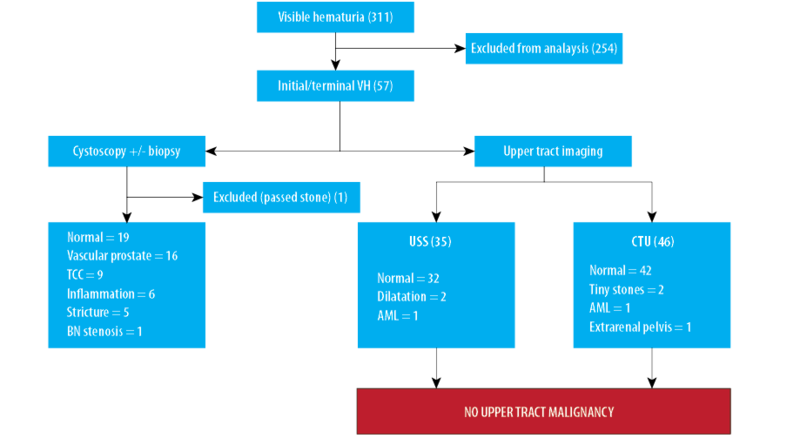 Reassuringly, in around a third of patients no LUT abnormality was encountered, while in another third, an enlarged and vascular appearing prostate was suspected to the source of bleeding, though this could not be proven at the time. Nevertheless, nine (16.1%) patients did have an underlying bladder tumor identified on FC, of whom eight underwent a transurethral resection of bladder tumor (TURBT) with histology confirming them malignant. The remaining patient refused to undergo a TURBT, but his urine cytology confirmed high-grade malignant cells. In this group of nine patients with a LUT malignancy, three had initial VH, while the remaining six had terminal VH. Other benign, but important diagnoses included urethral stricture disease in five, BN stenosis in one, and inflammatory changes in the bladder in a further six patients. Thus, FC examination in those with initial and/or terminal VH is essential and should be performed in all cases unless otherwise contraindicated. VH is still regarded as the most common presenting symptom for UUT cancers, though the frequency of detecting such tumors in patients with VH is low (0.7–1.6%).13–15 In our study, there were no UUT malignancies among patients with a history consistent with LUT bleeding, and one speculates, though without evidence thus far, that initial or terminal hematuria would be inconsistent with bleeding from higher up in the urinary tract. Total hematuria is more likely to be the mode of presentation for UUT pathology. Our study did demonstrate some inconsistencies in the use of USS and CTU. This was in part due to the availability of a one-stop hematuria service in one of our hospital sites, which facilitated an USS during the same initial consultation. USS is known to be quick, safe, and was reassuring normal in the majority of our cohort, and its use for the investigation of such patients appears justified. The diagnostic accuracy of CT performance is high with a reported sensitivity of 88–100% and specificity of 93–100% for UUT abnormalities.16–18 In our cohort, 46 (80.7%) patients underwent CTU imaging (2-phase reduced radiation scan using 100 mL intravenous Niopam 370 contrast) and the only additional pathology on CTU compared to USS was the finding of small (2–3 mm) non-obstructive renal stones in two patients. The sensitivity of USS for detecting kidney stones has been reported to be 64% to 96%.19,20 The two patients in our study with small renal stones were asymptomatic, and it is unlikely that the non-diagnosis of these small stones would have resulted in any significant adverse effect in the short-term given that contemporary practice is not to treat such stones. The current guidelines recommend UUT contrast imaging for patients with newly diagnosed bladder cancer if they are identified in the bladder trigone or if they are of high-risk potential.21 It is noteworthy that CTU did not demonstrate any UUT malignancies, even in our patients diagnosed with a bladder tumor. Though the addition of CTU to an USS in such patients does not appear to increase the detection rate of any significant UUT pathologies, we noticed the increased detection of incidental non-urological findings including diverticular disease, aortic aneurysm, liver and pancreatic cyst, inguinal hernias, and adrenal adenoma. This frequently encountered phenomenon is commonly referred to as victim of modernized imaging technology. There are additional benefits to decreasing reliance on CT scanning. CTU imaging, with its reported doses of 14.8–22.6 mSv per study, exposes patients to ionizing radiation equivalent to 150- and 1100-times the radiation dose from a conventional X-ray or around a year’s worth of exposure to radiation from both natural and artificial sources in the environment.22,23 Several recent technical modifications, including the acquisition of fewer scanning phases and lower dose parameters, have reduced the overall dose received but inherent risks remain. Similarly, there may be cost-saving implications to reducing the use of CT scanning. We estimated the direct cost of the 46 CTU scans in our small series at approximately £6555. If our study findings are corroborated in future studies, there is a potential significant cost-saving opportunity. To the best of our knowledge, this study is unique in investigating the value of UUT tests in male patients with a history of VH strongly suggestive of bleeding from a LUT source. It represents an area with immediate relevance to the day-to-day urological practice. Nevertheless, we acknowledge the limitations in our study, which is primarily attributable to its small size and limited follow-up period. The minor variations in practice demonstrated by attending urologists may have been a factor though this very much reflects the practical nature of hematuria assessment in most departments and, in our opinion, does not detract from the findings. Our preliminary study demonstrates that significant upper tract problems are not encountered in male patients with a clear complaint of initial and/or terminal VH where the history is suggestive of bleeding from a LUT source. Mandatory CT scanning may not be necessary in such patients, and initial management could primarily comprise of a FC and USS, with CTU only advocated in case of persistent VH. This approach does require corroboration by way of larger, multicenter prospective data collection. This has the potential to change practice by decreasing the need for unnecessary CT scans, reducing investigation costs, patient inconvenience, and radiation exposure while maintaining a low risk of missing a significant pathology in the UUT. The authors declared no conflicts of interest. No funding was received for this study. The abstract of the project was presented as an e-poster during the American College of Surgeons Annual Congress in San Diego on 24th of October 2017 and was chosen to be of exceptional merit. The full manuscript has not been published elsewhere. The author acknowledges that this research was submitted in partial fulfillment of his master’s degree (ChM) in Urology to the University of Edinburgh. The author would like to acknowledge and express how thankful he is to all colleagues at his work base for their contribution and continuous support in identifying and recording the information needed to conduct this study. 1.1King K, Steggall M. Haematuria: from identification to treatment. Br J Nurs 2014 May;23(9):S28-S32. 2. Grossfeld GD, Carroll PR. Evaluation of asymptomatic microscopic hematuria. Urol Clin North Am 1998 Nov;25(4):661-676. 3. I think I might have blood in the urine (haematuria). BAUS online information for patients. 2017 [cited 2017 October]. Available from: http://www.baus.org.uk/patients/conditions/2/blood_in_the_urine_haematuria. 4. National Institute for Health and Care Excellence. NICE Guideline [NG2]. Bladder cancer: diagnosis and management; 2015 Feb.
5. Babjuk M, Böhle A, Burger M, Compérat E, Kaasinen E, Palou J, et al. Guidelines on non-muscle invasive bladder cancer (Ta, T1 and CIS). European Association of Urology. 2015 [cited 2017 October]. Available from: https://uroweb.org/wp-content/uploads/EAU-Guidelines-Non-muscle-invasive-Bladder-Cancer-2015-v1.pdf. 6. Abarbanel J, Benet AE, Lask D, Kimche D. Sports hematuria. J Urol 1990 May;143(5):887-890. 7. van der Molen AJ, Hovius MC. Hematuria: a problem-based imaging algorithm illustrating the recent Dutch guidelines on hematuria. AJR Am J Roentgenol 2012 Jun;198(6):1256-1265. 8. Messing EM, Madeb R, Young T, Gilchrist KW, Bram L, Greenberg EB, et al. Long-term outcome of hematuria home screening for bladder cancer in men. Cancer 2006 Nov;107(9):2173-2179. 9. Chang SS, Bochner BH, Chou R, Dreicer R, Kamat AM, Lerner SP, et al. Treatment of Non-Metastatic Muscle-Invasive Bladder Cancer: AUA/ASCO/ASTRO/SUO Guideline. J Urol 2017 Sep;198(3):552-559. 10. Britton JP, Dowell AC, Whelan P, Harris CM. A community study of bladder cancer screening by the detection of occult urinary bleeding. J Urol 1992 Sep;148(3):788-790. 11. Alberg AJ, Kouzis A, Genkinger JM, Gallicchio L, Burke AE, Hoffman SC, et al. A prospective cohort study of bladder cancer risk in relation to active cigarette smoking and household exposure to secondhand cigarette smoke. Am J Epidemiol 2007 Mar;165(6):660-666. 12. Golka K, Wiese A, Assennato G, Bolt HM. Occupational exposure and urological cancer. World J Urol 2004 Feb;21(6):382-391. 13. Khadra MH, Pickard RS, Charlton M, Powell PH, Neal DE. A prospective analysis of 1,930 patients with hematuria to evaluate current diagnostic practice. J Urol 2000 Feb;163(2):524-527. 14. Mariani AJ, Mariani MC, Macchioni C, Stams UK, Hariharan A, Moriera A. The significance of adult hematuria: 1,000 hematuria evaluations including a risk-benefit and cost-effectiveness analysis. J Urol 1989 Feb;141(2):350-355. 15. Albani JM, Ciaschini MW, Streem SB, Herts BR, Angermeier KW. The role of computerized tomographic urography in the initial evaluation of hematuria. J Urol 2007 Feb;177(2):644-648. 16. Jinzaki M, Matsumoto K, Kikuchi E, Sato K, Horiguchi Y, Nishiwaki Y, et al. Comparison of CT urography and excretory urography in the detection and localization of urothelial carcinoma of the upper urinary tract. AJR Am J Roentgenol 2011 May;196(5):1102-1109. 17. Cowan NC, Turney BW, Taylor NJ, McCarthy CL, Crew JP. Multidetector computed tomography urography for diagnosing upper urinary tract urothelial tumour. BJU Int 2007 Jun;99(6):1363-1370. 18. Chlapoutakis K, Theocharopoulos N, Yarmenitis S, Damilakis J. Performance of computed tomographic urography in diagnosis of upper urinary tract urothelial carcinoma, in patients presenting with hematuria: Systematic review and meta-analysis. Eur J Radiol 2010 Feb;73(2):334-338. 19. Sinclair D, Wilson S, Toi A, Greenspan L. The evaluation of suspected renal colic: ultrasound scan versus excretory urography. Ann Emerg Med 1989 May;18(5):556-559. 20. Middleton WD, Dodds WJ, Lawson TL, Foley WD. Renal calculi: sensitivity for detection with US. Radiology 1988 Apr;167(1):239-244. 21. Babjuk M, Oosterlinck W, Sylvester R, Kaasinen E, Böhle A, Palou-Redorta J, et al; European Association of Urology (EAU). EAU guidelines on non-muscle-invasive urothelial carcinoma of the bladder, the 2011 update. Eur Urol 2011 Jun;59(6):997-1008. 22. Frush DP, Applegate K. Computed tomography and radiation: understanding the issues. J Am Coll Radiol 2004 Feb;1(2):113-119. 23. Nawfel RD, Judy PF, Schleipman AR, Silverman SG. 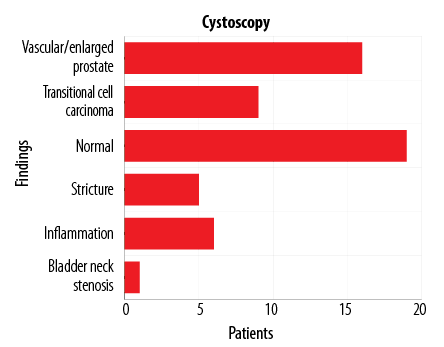 Patient radiation dose at CT urography and conventional urography. Radiology 2004 Jul;232(1):126-132. 24. Brown FM. Urine cytology. It is still the gold standard for screening? Urol Clin North Am 2000 Feb;27(1):25-37. 25. Viswanath S, Zelhof B, Ho E, Sethia K, Mills R. Is routine urine cytology useful in the haematuria clinic? Ann R Coll Surg Engl 2008 Mar;90(2):153-155.